What is the Availability Bias? The availability bias determines the facts that you pick to support your case when you are reasoning something through or making a decision. The brain uses the data that it can pull from memory most easily. You are trying to make a decision, and need to make it quickly, so you take the first thing from memory, without assessing whether it is actually representative of what you are trying to sort out. It’s just the first thing you think of. People believe that they are more likely to be killed in a shark attack or murdered by a stranger than, say, in a car accident. This is because, although these events are extremely rare, when they do happen they are widely reported in dramatic fashion and so create a strong emotional response. In the wake of a train or air crash people start to use other forms of transport. However, once the event has faded from their mind they go back to their previous travel preferences. Good questions all help your stakeholder to think more deeply about the problem. Another way of overcoming the availability bias is to use a structured problem-solving technique. 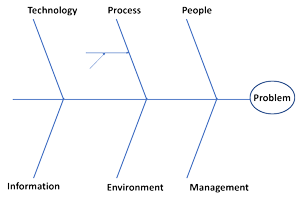 One of my favourites here is the Ishikawa or fishbone diagram. It is a really useful way of getting past the first thing stakeholders think of, especially when you are looking for the root cause of a problem. 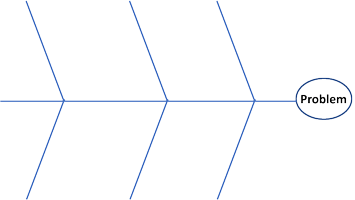 It achieves this by getting people to think of other examples around that problem in different facets. To use an Ishikawa diagram you first identify your problem, and put this in the head of your ‘fish’. Is this problem caused by the technology? Is it caused by the process? Is it the information we have? Is it the environment we’re working in? But you can pick whatever works in your environment. You list your possible causes out along the spine of the fish. If you need to you can look at the causes of the causes too. This gives people a different way to look at the problem, helps pull out different aspects and moves people away from that first thing they thought of, to what may really be the cause. 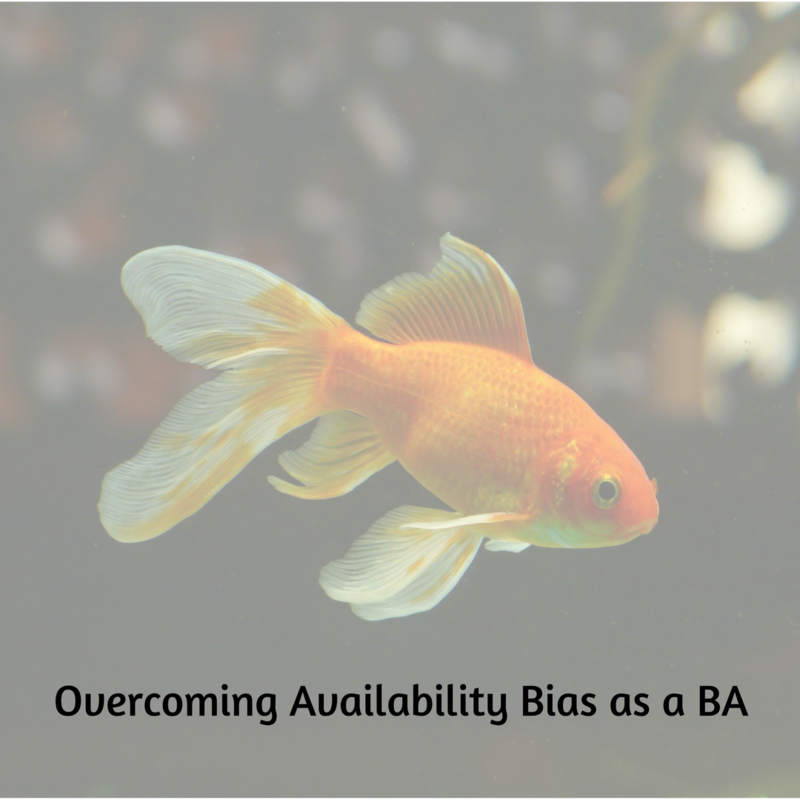 I was a guest on Penny Pullan’s BA Virtual Summit early in 2018 talking about cognitive biases and the Business Analyst. As part of this attendees were invited to submit questions to speakers. As Penny was kind enough to provide me with a transcript of my discussion with her, I am sharing the questions and my answers as a series of blog posts. Edited, of course, to make me sound like I can string a coherent sentence together! This entry was posted in Cognitive Biases, Hints & Tips, Psychology and tagged fishbone, Ishikawa, Pullan. Bookmark the permalink.